For some months, Roger Potts and is wife Jenny Fenton, had been trying to trace the story of his grandfather, Frederick Swannell. 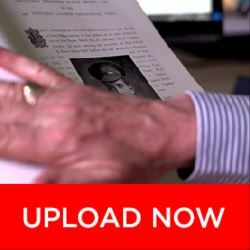 Although they had scant details about his Great War; just his name and army number, there was one additional item they felt might yield some clues. 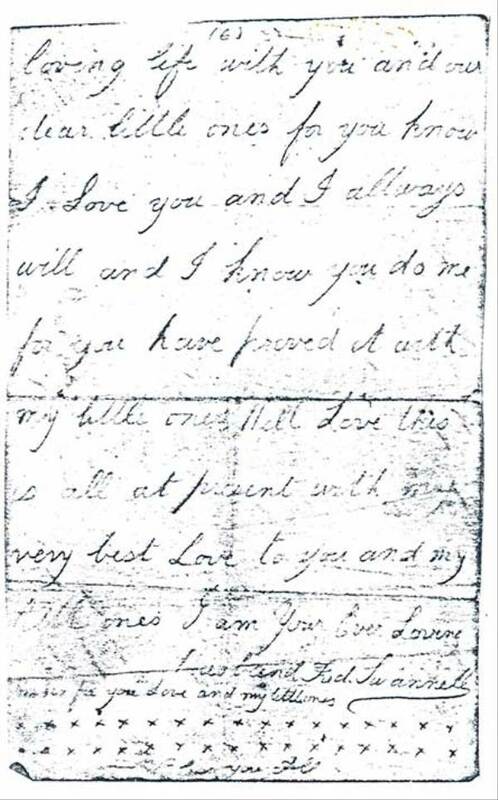 It was a fragile and fading love letter written by the lance corporal to his beloved wife Ellen (Nell). 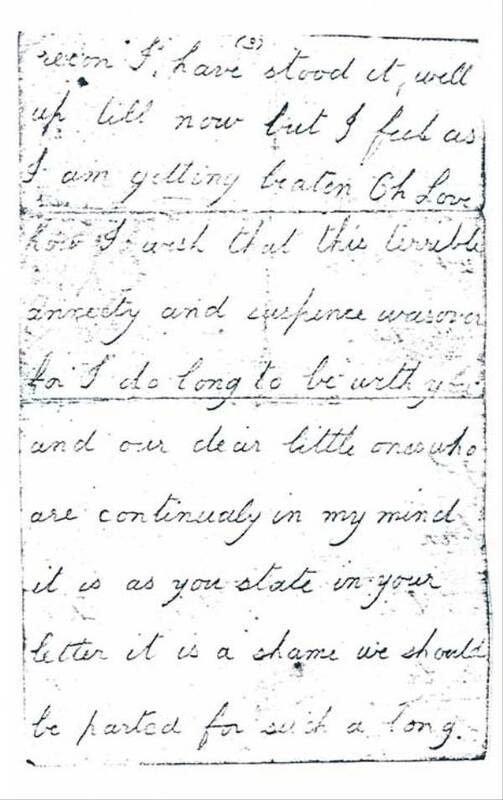 A letter that says so much more than a photograph ever could. Roger’s mother had chanced upon it following the 98 year old widow’s death in 1981. She’d found it tucked away in Nell’s handbag. The grieving widow had carried it with her every single day after Frederick’s tragic death in the trenches in 1917. 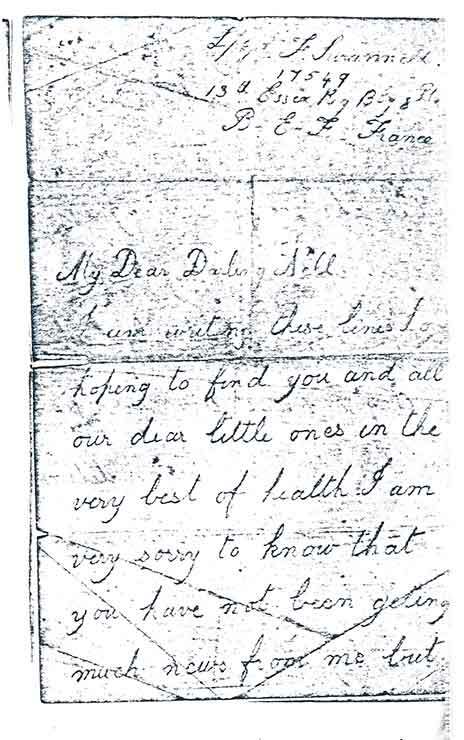 So touched were the family with this discovery that they placed the original alongside Nell in her sealed coffin, but kept a copy as a keepsake and reference. 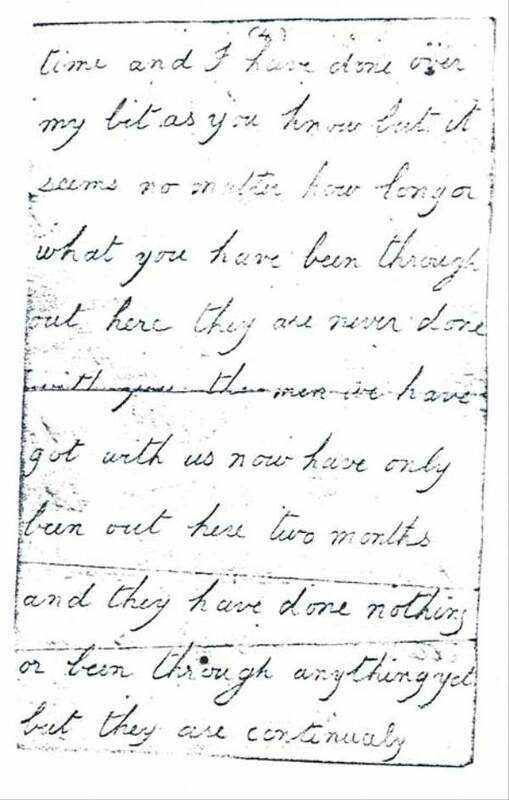 The beautifully scripted letter spoke volumes about the personal cost of the war and the terrible physical and mental toll of trench warfare. This was a war that soldiers had grown sick of not simply from the terrifying bombardments, but the stench, mud and disease. Lance Corporal Swannell was clearly most fearful that he would never return home to his adored wife and five small children. Frederick and Nell had a son also named Frederick and four small daughters: Ellen, twins Elizabeth and Emily, and Charlotte. Frederick Swannell Junior was known to live with his grandparents due to a busy home life and the logistics of looking after four girls of a similar age. 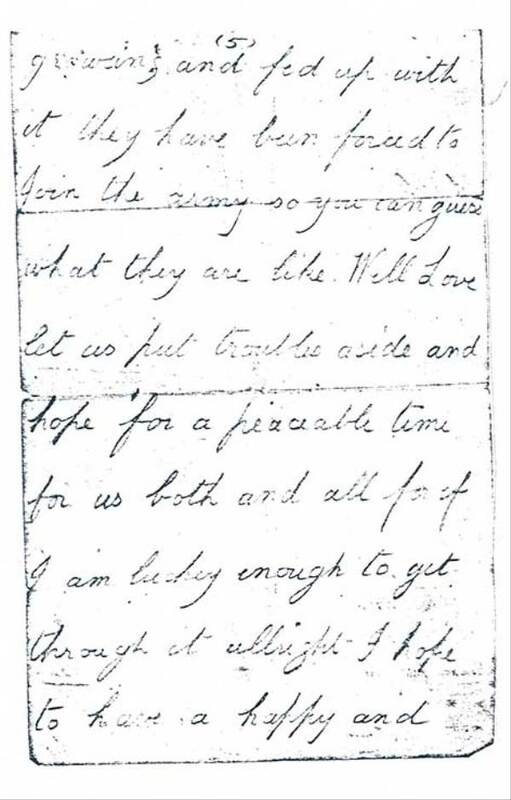 From the few factual details contained within the letter of name, rank and service number, FWR researcher Tom Bennington was able to trawl the website’s documents and data and fill in the story’s gaps: Frederick’s age at death, where he died and further detail about his unit. And there was more: he revealed that Lance Corporal Swannell, a French polisher in civilian life, had become part of the 6th Brigade of the 2nd Infantry Division who defended Oppy Wood during the Battle of Arleux, France (April and May 1917). He explained that this heavily strategic battle began in a snowstorm and was soon known as the greatest killing battle of the war, with a daily casualty rate of 4,076. On 28 April 1917, eight days into the military operation, and aged just 35, Frederick was declared missing, presumed killed. In total, 158,000 British and Commonwealth troops were injured or killed during the battle, when trying to break through the German defences. Tom was also able to let Roger and Jenny know that Frederick is remembered at the Arras memorial, in the Faubourg-d'Amiens Cemetery – and that his name was recorded on the roll of honour in bay seven of the Memorial in the Pas de Calais. The monument commemorates 34,785 United Kingdom, South African and New Zealand soldiers, with no known grave; all of whom died in the Arras sector between spring 1916 and 7 August 1918. 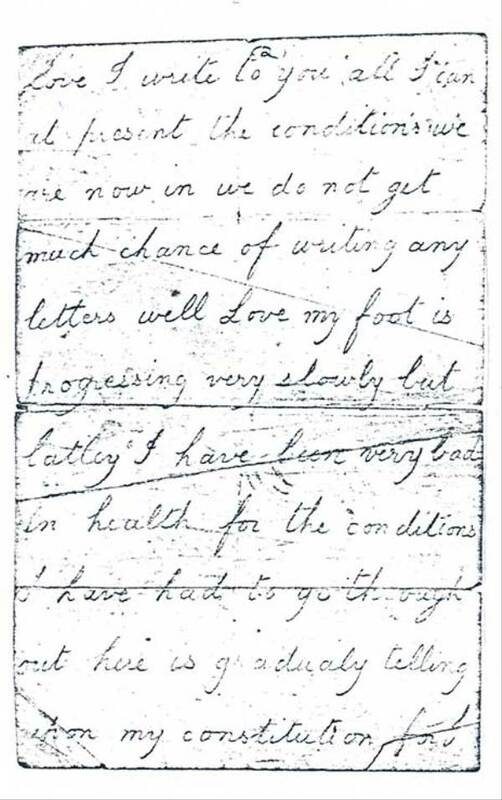 Jenny commented: “Every time my husband and I read Frederick’s letter it brings a lump to our throats and tears to our eyes. 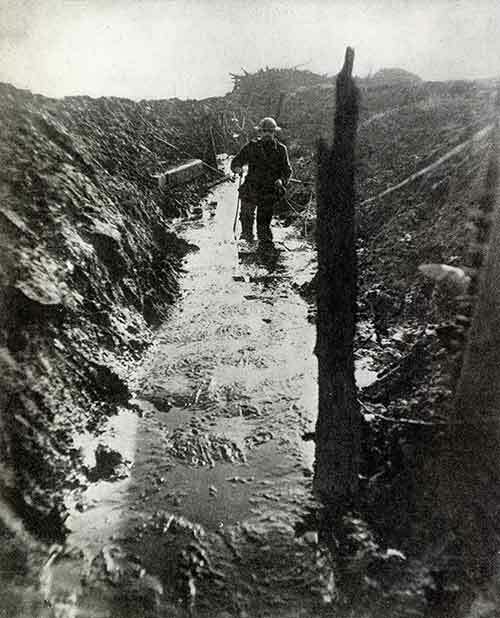 It vividly illustrates the horror of his life at the front and of his desperate wish to be home with his young family. I am writing these lines hoping to find you and all our dear little ones in the very best of health. I am very sorry to know that you have not been getting much news from me but love I write to you all I can. At present the conditions we are now in we do not get much chance of writing any letters. Oh love how I wish that this terrible anxiety and suspense was over for I do long to be with you and our dear little ones who are continually in my mind. It is as you state in your letter, it is a shame we should be parted for such a long time and I have done over my bit as you know, but it seems no matter how long or what you have been through out here they are never done with you. Well love let us put the troubles aside and hope for a peaceable time for us both and all, for if I am lucky enough to get through it alright I hope to have a happy and loving life with you and our dear little ones for you know I love you and I always will and I know you do me for you have proved it with my little ones. I am your ever loving husband Fred Swannell.